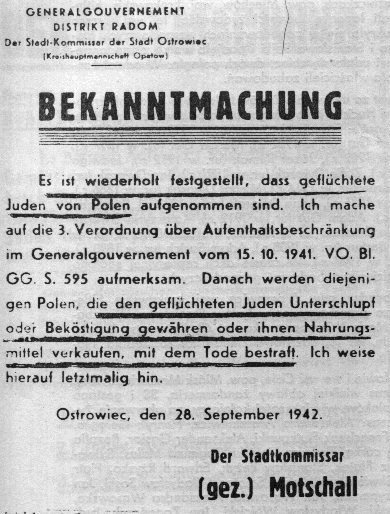 Few people know that among all the countries occupied by the Third Reich during the Second World War (1939-1945) only in Poland was any kind of help to a person of Jewish faith or origin punishable by death. This penalty was widely announced by the occupying authorities. What is more, this punishment was quite often imposed not only on the rescuer, but also on his/her family, often on neighbors, and on whole towns or villages. The Germans believed in collective responsibility, trying to eliminate as many Poles, and Slavic people, as possible, making them the most terrorized populations after the Jews and the Gypsies. Close to three million Polish Christians lost their lives by execution, torture, starvation, or overwork in more than 2,000 prisons, forced labor and concentration camps. The occupiers persecuted not only the intelligentsia, (educated classes) and opponents of the new regime but all potential opposition leaders, including simple peasants. Millions were deported to Germany for forced labor. Millions of Jews and Poles were expelled from the Western provinces, which had been annexed to the Third Reich, a territory that included the site of the death camp Auschwitz, where approximately 80,000 Poles were killed. Military losses during the September 1939 campaign amounted to 66,300 Polish soldiers killed, more than 133,700 wounded and 587,000 captured. Between the German invasion of Poland on September 1, through October 2, 1939 the Polish Army destroyed approximately 33% of German armored cars and 25% of German air power. During that time the Germans had to use more than twice the amount of ammunition, artillery shells and bombs than they did eight months later when they defeated French and British forces within six weeks. See: Iwo Cyprian Pogonowski, Poland: An Illustrated History. New York, Hippocrene Books, 2000. The names of Poland’s towns and streets were Germanized. 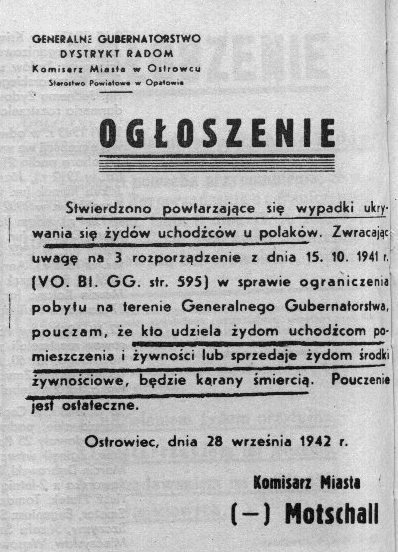 Speaking Polish in public in the incorporated provinces was prohibited. 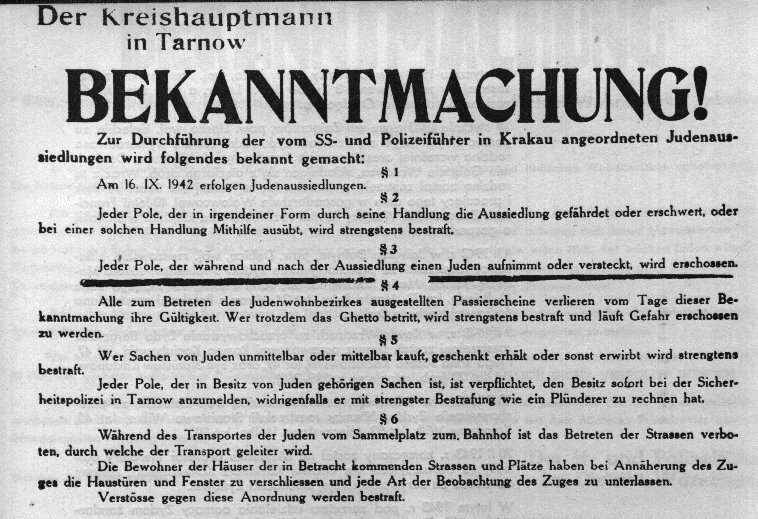 In the predominantly German-populated area of Gdansk (renamed Danzig) the public use of Polish language became a capital offence on September 4, 1939. 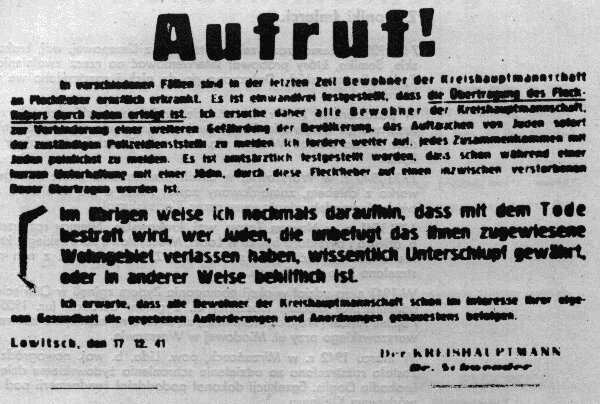 On August 22, 1939, a week before his attack on Poland, Hitler exhorted his nation: "Kill without pity or mercy all men, women and children of Polish descent or language. Only in this way can we obtain the living space we need." As many as 200,000 Polish children, deemed to have "Germanic" (Aryan) features, were forcibly taken to Germany to be raised as Germans, and had their birth records falsified. Very few of these children were reunited with their families after the war. More than 500 towns and villages were burned, over 16 thousand persons, mostly Polish Christians, were killed in 714 mass executions of which 60% were carried out by the Wehrmacht (German army) and 40% by the SS and Gestapo. In Bydgoszcz the first victims were boy scouts from 12 to 16 years old, shot in the marketplace. All this happened in the first eight weeks of the war. See Richard C. Lucas, The Forgotten Holocaust; The Poles under German Occupation. Lexington: The University Press of Kentucky [c1986]. In the East, the Russians, collaborating with the Germans (Hitler-Stalin pact of Aug. 23, 1939) attacked Poland on September 17, 1939, and occupied the eastern part of Poland until June 1941. Massive killings followed, among them 21,857 officers, mostly reserve members of the army, police and frontier guards, whose bodies were found later in Katyn, Miednoye, Kharkov, Tver. Other bodies from these massacres have never been found. About two million Poles, mostly members of the intelligentsia, were deported to Siberia or to Kazakhstan in Central Asia. More than half never returned; thousands were killed in the fighting and over 452,000 became POWs in Soviet Russia. Poland disappeared from the European map, divided between Third Reich and the Soviet Union. Out of its pre-war population of 36 million, Poland lost 22%, a higher percentage than any other country in Europe. The heaviest losses were sustained by educated classes, youth and democratic forces that could have challenged totalitarianism. See I. C. Pogonowski, Poland: A Historical Atlas. New York, Hippocrene Books, 1987. 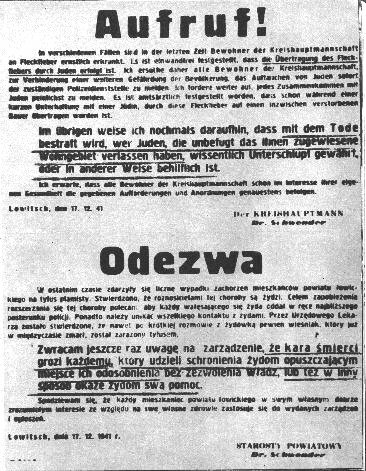 According to the AB German Plan, Poles were to become a people without education, slaves for the German overlords. Secondary schools were closed; studying, keeping radios, or arms of any kind, or practicing any kind of trade were prohibited under the threat of death. In 1988, the public prosecutor, Waclaw Bielawski, from the Main Commission for Investigation of Crimes Against the Polish Nation, issued a list of 1,181 names of Poles who had been killed for helping Jews during World War II. In 1997, the Main Commission – The Institute of National Memory and The Polish Society for The Righteous Among the Nations in Warsaw, published Part III in the series Those Who Helped: Polish Rescuers of Jews during the Holocaust. It reduced the list of 1,181 names to only 704, by accepting only those whose accounts could be independently corroborated and verified fifty years later. The publication also included the names of more than 5,400 Poles, who have been recognized by the Israeli Yad Vashem Institute – The Holocaust Martyrs’ and Heroes’ Remembrance Authority in Jerusalem, as “Righteous Among the Nations.” About 17,000 people of 34 nationalities were similarly honored. In Western Europe the automatic death sentence for help rendered to Jews did not exist and applying it to a whole family or neighbors was unthinkable. The reign of terror that organized in Poland was completely isolated, and unimaginable in the West. Saving Jews was very difficult, as about 85% of Poland’s Jews either did not speak Polish or spoke a dialect. In many cases, Jews were distinguished by their appearance. Poland, under the Soviet-imposed communist regime that lasted from 1948 until 1989, was cut from the West. Poles lost contact with the Jewish persons they saved, most of whom left the country. Many Polish Jews changed their names, either under the occupation or after settling abroad. Furthermore, it was dangerous to maintain correspondence with the West. Many of the rescuers also changed their addresses, due to the massive migration from the eastern part of the country, incorporated into the Soviet Union, to the western territories that passed to Germany after the war. The stories of the rescuers are a shining example of the most selfless sacrifice, surpassing in its heroism that of all the soldiers on the battlefield, whom we commemorate each November. In fact the soldier must fight; he cannot refuse. He is sustained by the entire military organization and his efforts are mostly limited to battles that have a clear beginning and end. He is paid and given the food, supplies and weapons that he needs. Rescuers of Jews in Poland were alone, often deprived of their pre-war means of livelihood, expelled from their farms, factories, businesses, offices and even homes, most of them living in dire poverty. All found it virtually impossible to earn a living. They were under no legal obligation to risk their own lives and, even more, those of their families and neighbors. Their help most often lasted days and nights, weeks, months, even years, always in secret, and always risking discovery. Who of us would do it today, especially in the above mentioned conditions? Wartime Rescue of Jews by the Polish Catholic Clergy. The Testimony of Survivors. Compiled by Mark Paul. Polish Educational Foundation in North America, Toronto 2010. (Requires Acrobat Reader). According to the vol. III of "Those Who Helped" of 1997, by the Main Commission mentioned here. Due to the omission of Polish diacritical marks the alphabetical order is slightly different from that in the English language. (Remarks about the Polish alphabetical order). List of approximately 5,400 Poles recognized as "Righteous Among the Nations" title bestowed by Yad Vashem of the State of Israel (as of Dec. 31, 1999). Due to the omission of the Polish diacritical marks the alphabetical order of names is slightly different from the English one. Notes about the names are based on the Bibliography and on my own documentation. Photographs of some Poles recognized by Yad Vashem as "Righteous among Nations"
About the people who saved me. Could I have done the same thing? Could I shelter a foreign son in my home? Constantly be threatened by certain evil? Hearing footsteps of certain evil. Not one day, not one week, but so many years! Not having any pension – not having anything for this. Because a person to person must be a people. Could I have done the same if I was in their place? It was they who went to war every day. It was they who made the world a place for me. Who this day this world is founded by. In front of you the Righteous I bow. Poem's original Hebrew version. Its English translation appears in “Those who Helped” in 1996 and in 1997. Polish version appears in Grynberg, op. cit.